1. We watched Silver Linings Playbook this month, starring Bradley Cooper as Pat, a man recently released from an inpatient psychiatric facility and obviously still wrestling with his illness (bipolar). He eventually meets Tiffany (Jennifer Lawrence), who is dealing with depression and grief herself, and the two help each other adjust to life in the midst of their struggles. The film does a great job of portraying the illness of each (it had psychology major Coffeewife's approval), as well as environmental factors such as enabling and/or eggshell-walking family members, the death of loved ones, and the role of coping mechanisms. It was easily one of the better movies I've seen this year. 2. I recently read Letters to Pope Francis, which I reviewed the other week. 3. 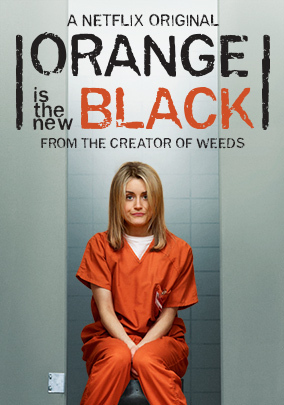 I've heard so much about Orange is the New Black that I finally broke down and started watching. I have to say that I really wasn't sure about it after one episode. But then I watched another, and now I'm five episodes in, making it a point to watch it over lunch or after the family has gone to bed. We meet Piper, an uppity New Yorker who gets sent to prison for something she'd done ten years earlier. The tagline for the show is "Every sentence is a story," which holds true as we learn the background of some of the other inmates: not just why they got arrested, but what their lives were/are like otherwise: relationships, background, and so on. It's ended up being incredibly captivating, with the right mixture of drama and comedy. 4. Back when I completed my 19th Annotation Retreat of Ignatius' Spiritual Exercises, my spiritual director gave me a copy of The Examen Prayer by Timothy Gallagher. It had been sitting on my nightstand since then, and I finally got to it the other week. The examen is a type of prayer based on reviewing one's day (or some other set period of time) that originated as part of his Exercises. I've prayed this prayer--or some version of it--over the years, but hadn't learned about it with as much depth as is covered here. There are actually five pieces to the examen: gratitude for what God has done, petition for God to be present and to reveal God's will, the actual review of one's day including where God may have been in the midst of it, asking/realizing/accepting God's forgiveness, and renewal of oneself and one's actions while looking toward a new day. Gallagher provides an excellent introduction, and I hope to make this prayer a more regular part of my life.